Any professional association worth its salt not only educates and advocates for its industry, but also works for the industry’s future. A crucial component of the nursery and landscape’s future is encouraging young people to embrace industry careers. WVNLA and the secondary school system in West Virginia took a big step in that direction on November 13 when education officials presented documents to companies whose owners agreed to participate in a newly launched apprenticeship program at Carver Career and Technical Center in Malden. The program is the first partnership with a career and technical center in West Virginia. The signing ceremony, in which Cary Levenson of Valley Gardens in Charleston and representatives of Terra Care in Malden and Lisa’s Gardenscapes in Cross Lanes agreed to take on student apprentices, was the result of efforts between staff members at Carver Career and Technical Center and the U.S. Department of Labor to launch a pilot apprentice program at the school. “This is an exciting day for us all. This apprenticeship is ground-breaking in the state, and perhaps even at a national level,” said Jim Foti, regional director for the U.S. Department of Labor (DOL). Dr. Kathy D’Antoni, who is an assistant superintendent of the state Department of Education, enthused about the partnership between schools and employers, while she also shined a light on the students attending the ceremony. After the ceremony, several plant science students introduced themselves to the landscaping company representatives and talked about their plans. WVNLA’s involvement with the program began when executive director Julie Robinson attended an apprenticeship seminar last year. She had the good fortune to sit beside Karen Wade of the DOL and asked about apprentice programs in the green industry. Karen said a landscape technician track was available. Karen worked with instructors and administrators at Carver to meet DOL program requirements. Lisa McDavid of Lisa’s Gardenscapes and Julie met with the plant science instructor Sandy Lynch and Karen to discuss the landscape technician apprenticeship. When asked about sponsoring an apprentice, Cary Levenson and Kevin Arnold of Terra Care readily agreed to work with one. Lisa was already onboard for this pilot program. The apprentice process is an age-old and time proven method to provide motivated students with the tools, experience and expertise needed to give them a solid start in their chosen careers. Employers have the opportunity to match potential employees with a mentor to guide them along the way. Carver students will be ready to go to work part-time in the spring 2019 semester on the terms arranged by their employers. As an industry, we are grateful to Carver for launching the apprenticeship program to provide opportunity that benefits both the apprentice and the employer. West Virginia Nursery & Landscape Association and the West Virginia Department of Agriculture will offer a Pesticide Applicators Recertification Training session on January 29 at the Embassy Suites Hotel in Charleston. Registration is free for WVNLA members and $50 for nonmembers. View the day’s agenda here. WVNLA’s 2019 Winter Symposium was held Wednesday, January 30 in Charleston. Speakers with backgrounds in ecological planting design, community gardens, landscape architecture education, horticulture, landscape company management, pricing, estimating, and regulatory compliance presented concepts and answered questions. For an idea of future Winter Symposium formats, view the day’s schedule here, or read speaker bios below. Cost to attend is $50 for WVNLA members and $100 for non-members. Registration includes lunch. Two sessions will run simultaneously, one with a focus on design elements and the other featuring successful green industry business practices. Claudia West, a leading voice in the emerging field of ecological planting design, will present “Stunning Plant Communities that Stand the Test of Time.” Claudia is known for her passionate advocacy of plant-driven design, Claudia is a widely sought out speaker and consultant who applies the technologies of plant systems to bring essential natural functions back into our cities and towns. She has worked on all sides of the green industry—as a designer, a grower, installer, and land manager—grounding her innovative work in pragmatic solutions that address the realities of our urbanizing world. She is the co-author of the critically acclaimed book, Planting in a Post-Wild World (Timber Press, 2015). Barbara Arnold, senior horticulturist at Franklin Park Conservatory and Botanical Gardens, will speak on “Creation and Use of a Public Garden Community Garden Campus.” She will explore the different focuses of community gardens —education, healthy food source, a place of beauty. Community is the element they all have in common. Franklin Park Conservatory and Botanical Gardens Scott’s Miracle-Gro Community Garden Campus is all of those and more. Hear how community members young and old had a voice in the creation of the garden. See how a creepy- quiet part of the park came to life. Gain an understanding how Conservatory departments (horticulture, event sales, development, community outreach and education) worked to create a beautiful and useful garden. Learn how Franklin Park Conservatory’s plot holder program is run and operated. Barbara has worked in the green industry for more than 30 years with experience in commercial landscaping, public gardens and golf courses. For the past 23 years, she has been a member of the horticulture staff at Franklin Park Conservatory and Botanical Gardens. Peter Butler, director of the school of design and community development, an associate professor of landscape architecture and extension specialist in landscape architecture at West Virginia University, will speak on “Western European Landscapes.” His presentation will feature the many student tours he has led through these gardens. The travel experience includes the interpretation and sketching of gardens, landscapes and architecture ranging from the medieval to contemporary with horticulture and landscape architecture students. Peter holds a BA in English and creative writing from the University of Wisconsin-Madison and his bachelors and masters degrees in landscape architecture from Iowa State University. His research interests include cultural landscape research and planning; community design process; industrial landscape reclamation and interpretation; and design studio pedagogy. Before entering academia, Peter worked as a gardener and landscape construction supervisor in Seattle WA, Driggs ID and Nantucket MA. Preston Montague, artist and landscape designer, will discuss “Approaches to Designing with Plants.” Making design decisions in the landscape can be a frustrating challenge for both green industry professionals and home gardeners alike. Preston will demonstrate some of his approaches to designing with plants that can help demystify the process of deciding “which plant, where, and how many?” He will discuss strategies design professionals use to create outdoor rooms that are environmentally responsive and that provide for a range of activities. Preston is a naturalist working to improve public and environmental health through the arts, education, and landscape architecture. He is passionate about inspiring curiosity and encouraging a sense of agency in people to affect positive change in their environment. Preston strives to help people make the connection between the health of the planet and the quality of their lives. Andrew Bunting, vice president of horticulture and collections at the Atlanta Botanical Garden, will present “Designing with Tropical Plants,” especially as used in outdoor seasonal displays. Andrew was previously with the Chicago Botanical Garden and was the curator at the Scott Arboretum of Swarthmore College in Pennsylvania for 25 years. He also owned a landscape design and construction business called Fine Garden Creations, Inc. Originally from Illinois, Bunting received his bachelor of science degree in plant and soil science from Southern Illinois University at Carbondale. Steve Rak is the president of Southwest Landscape Management. Steve is a past president of Ohio Landscape Association and has written for many publications. He currently writes for Turf magazine. Jeff Rak, CLP, is the president of Land Creations Landscaping and is also a past president of Ohio Landscape Association. Jeff is a graduate of Ohio State University Agricultural Technical Institute with a degree in Landscape Contracting and Construction. Land Creations has won several awards and been recognized in many publication and local TV stations. James Huston has more than 30 years of diverse business management experience and holds an MBA degree in finance. He is also a member of the American Society of Professional Estimators. He is one of only two Certified Professional Landscape Estimators in the world. As a Captain in the U.S. Marine Corps, he held positions in finance, aviation supply inventory management and procurement. After his tour of duty, he became a senior production control analyst for the Electronics Division of General Dynamics. Since 1987, he has been a management consultant to the landscape and irrigation industry. He headed the consulting division for Charles Vander Kooi and Associates, Inc., and in 1989 he formed J. R. Huston Consulting. Prentice Cline, OSHA Charleston area office director, will present “How to Keep Your Business on OSHA’s Good List.” Prentice will cover common and potential citations issued by OSHA to landscape operations and how to avoid them. He’ll discuss best practices for safety and health management plans. Prentice holds bachelors and masters degrees in environmental and occupational health and has 25 years of experience in occupational safety and health field. He has been with OSHA for 19 years and in his current position for 8 years. The Winter Symposium will be held January 30 at the Embassy Suites, 300 Court Street in Charleston. Congratulations to Dustin Trychta, a West Virginia University horticulture student who was selected as WVNLA’s 2018 Marcus W. Rennix Memorial Scholarship winner. After graduating from high school in 1998, Dustin entered the army and was stationed as a cook in Budingen, Germany, for nearly seven years. He was honorably discharged in 2005 as a sergeant. He then worked as a civilian in security and quality control before settling into a 10-year stint in appliance installation. Dustin’s interest in horticulture began with cleanup of the yard of his first home, which had been neglected by the previous owner. After removing weeds and stumps, and regrading his yard to solve some runoff issues, Dustin tackled his first full-scale landscape project in his own yard. Then, learning as he went, he began planning and installing residential landscapes for coworkers and family. Later, his horticultural interests broadened beyond general landscaping to giant vegetable gardening. This interest would later lead to his display of his giant gourd, “Pebbles,” in WVU’s student union as part of Mountaineer Week festivities. Dustin also provided additional oversized gourds, which were hollowed out to be “boats,” for the first Giant Pumpkin Regatta Boat Race, held in Morgantown last fall. Below, Dustin offers more information about his interesting background and future plans. What brought you to WVU? My wife, Kirsha Trychta’s, career as a law professor was a catalyst in our decision to become Mountaineers. She was offered a job here. A large factor in the decision was that I could finally pursue a degree in horticulture. It was a decision for two careers, rather than just one. How do you think your experience as a nontraditional student with military background prepares you for a career in horticulture? My military experience is a tremendous help in both completing my education and starting a career in horticulture. As a former cook in the military, I am familiar with working long and varied hours while performing strenuous tasks. The military taught me the value of waking early and resting late when deadlines are fast approaching. The military, in general, requires a broad set of skills, much like the horticulture industry. It also matured me and instilled leadership qualities that will be necessary when I expand my work into the employment of others. How is your college experience different from that of traditional students? Most notable is my understanding that I only get out of my education what I’m willing to put into it. Most college students are here because their parents told them they had to go to college, while others want to be here but are unsure what they want to do in life. I am fortunate enough to have lived some life prior to school and to know exactly what I want to study. I also very much appreciate coming home to my peaceful backyard garden every day, rather than a dorm room. You have expressed an interest in starting a small-scale nursery specializing in the grafting of ornamental hardwoods. That is a very specific goal. How will you get there? I have been giving that question a lot of thought. My educators and mentors tell me that is not the most logical idea, especially in Morgantown, where I live. However, my heart tells me that there is nothing I cannot accomplish, once I am determined to do it. The answer probably lies somewhere in between. If I pursue that dream, I know it will take dedication to my craft and long hours, often without a paycheck. It will take support from my wife and family, as well as continuing relations with industry professionals and members of organizations such as WVNLA, who can provide valuable insight. You mentioned volunteer activities. Where do you volunteer? The main place I volunteer is at WVU in the organic farm, where I display giant pumpkins for school activities. I also volunteer for various projects at school and through the WVU Horticulture Club. I partnered with North Elementary School in their fourth-grade gardening program, and I have helped build or repair high tunnels and raised beds, and amend soil. I helped erect a high tunnel for Operation Welcome Home in Mylan Park, which is designed to teach local veterans how to extend the growing season and increase self-sustainability. I also auctioned off a party in my giant-pumpkin patch to raise money for a program in WVU’s College of Law. Agriculture students from Trinidad and Tobago attended the party, and I taught them about techniques we use to increase efficiency and yields. My wife (who is a teaching associate professor and director of the Academic Excellence Center at WVU’s College of Law) and I love to travel together. We like to visit new places but also enjoy amusement parks and thrill rides. We enjoy puzzle games and trivia, and the occasional bingo night with her mother. We are planning a dream vacation when I graduate to tour the West Coast and see the majestic redwoods. Do you think it is likely that you will remain in West Virginia after your 2019 graduation? As of now, I have no intention of leaving West Virginia. When we moved here, we bought a home and intended to put down roots. Morgantown has been very kind to us and West Virginia is a beautiful state. I can’t promise that I will be here in five years, but if you had asked me five years ago where I would be, I wouldn’t have thought it would be here. No matter where life takes me, I will always hold West Virginia close to my heart. I would like to thank WVNLA for supporting me and my education, and also for its support of the WVU Horticulture Club. 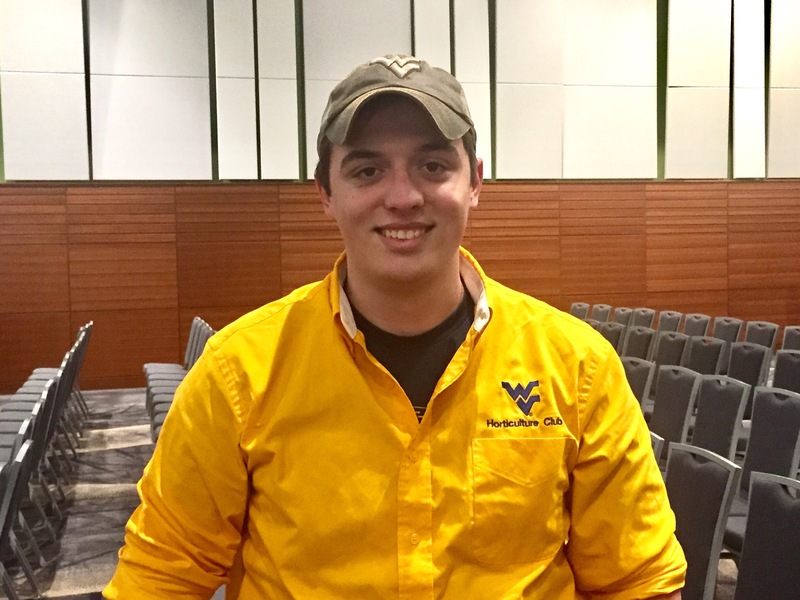 It is in great part due to WVNLA that WVU students compete annually at the National Association of Landscape Professionals Collegiate Landscaping Competition. The opportunity there is great for industry exposure and networking practice at the focused job fair. Employers at the job fair offer actual job and internship opportunities. Thank you for your continued support. You’ll want to mark September 8 on your calendar now. That’s the date WVNLA is partnering with Proven Winners to cosponsor the Proven Winners Landscape Roadshow at The Greenbrier. This full-day event at one of West Virginia’s finest resorts will feature experts from Proven Winners talking about new and exciting plant introductions, design tips and a behind-the-scenes tour of The Greenbrier’s beautiful grounds. WVNLA’s own Bob Barnitz of Bob’s Market and Greenhouses and Jason Testman of TerraCare will also speak. CEU credits will be available and lunch will be provided for $20. Space is limited, so register soon. For details and to register, click here. Prepare to be inspired and informed at the 2018 Winter Symposium on Jan. 26 in Charleston. Speakers with backgrounds in design, outdoor lighting, public gardens, plant research, software design, marketing, and labor are poised to present concepts and answer questions. The 2018 conference will be held at Embassy Suites. As usual, two sessions will run simultaneously, one with a focus on design elements and the other featuring successful business practices. Attendees may connect with colleagues over breaks and lunch and hear from other WVNLA members and horticulture and landscape architecture students from WVU during a post-lunch forum. Cost to attend is $50 for WVNLA members and $100 for nonmembers. To see the day’s schedule, click here. NatureScape Lighting owner Michael Deo will present “Designing a lighted landscape.” Michael is the president and founder of NatureScape Lighting in New Jersey, where he is an award-winning lighting designer. Since he is also formally trained in landscape design, his lighting projects reflect a deep knowledge of horticulture. He is keenly aware of how plants change, not only with the seasons but also over time and how each will react to light. Richard Hawke of the Chicago Botanic Garden will discuss “Top performing plants from trials” as well as “Green roof plant trials.” Richard is the plant evaluation manager for the botanic garden. He’ll hone his presentations to include plants selected to thrive in local horticultural zones, which he points out is a more inclusive list than those that will survive Chicago’s winters. Timothy Tilghman of Untermyer Gardens will present a fascinating look at the garden’s “Past, Present and Potential.” Timothy is the horticulturist at Untermyer Gardens in Yonkers, New York. In the 1920s and 1930s, the privately owned Untermyer Gardens were among the most celebrated in the United States. Sixty gardeners were employed to maintain the 150-acre estate. The gardens languished after the owner’s death in the 1940s, but are being restored today with Timothy at the helm. Tim Edick of Unilock Pavers will walk attendees through a demonstration on “3-D Design of hardscapes with software.” Unilock is a manufacturer of concrete interlocking paving stones and segmental wall products. Profits Plus speaker Tom Shay will present “Strategies to win in a changing economy.” As consumers change the way they do business, owners must adapt to survive. Tom is a fourth generation small business owner who has written and spoken extensively on small business management. Zackary Grossl, a junior majoring in landscape architecture at West Virginia University, was recently selected as the 2017 recipient of the Marcus W. Rennix Memorial Scholarship. Zack graduated from Greenbrier West High School and is the son of Dale Grossl and Tina Grossl. Zack didn’t start his college career in landscape architecture, but childhood memories and teenage work experience drew him to it. “I enrolled at WVU in the pre-pharmacy program in 2013, and by mid-semester I knew that I didn’t belong there. I then found landscape architecture,” Zack said. Zack finds the variety of work in the green industry appealing. He is interested in all aspects of it, including design, installation, plant production, and sales. According to WVU landscape architecture Assistant Professor Elisabeth Orr, Zack has earned a reputation among his instructors for being an intelligent problem solver, as well as an attentive, friendly student. His mastery of course work and his good rapport with fellow students led Orr to ask him to be a teaching assistant. Competition is stiff for these positions. Orr said it is a “significant honor” to be chosen. “As a native West Virginian, I am very proud of exceptional in-state students like Zack. I expect him to continue to excel in our program and to be an accomplished professional in the field after he graduates,” Orr said. We wish him every success. We welcome new members to West Virginia Nursery & Landscape Association. Landscape design and maintenance, lawn installation and maintenance, fertilizer and pesticide applications, fall lawn clean up, tilling, drain installation. Specializing in insect, disease and environmental problems diagnosis and control; turf management. 2432 Little Two Mile Creek Rd. Retail garden center, nursery supplies, perennial nursery. We are sad to note the closure of Terra Salis and retirement of its manager and former WVNLA president Bill Mills. An article that appeared in the Charleston Gazette-Mail provides details. Bobby Barnitz’s article in Greenhouse Grower provides insight on how an investment in an automated soil mixer yields big results at Bob’s Market & Greenhouses, Inc.